Soon, very soon, The Tuesday Prude will dive in and outline the behaviors and attitudes guaranteed to draw a prude’s ire. Before we draw the battle lines and wade into the fray, let’s take a gander at the Prude Armory with its stockpile of weapons. As we look around, take a moment to consider your status as Friend or Foe of Prudes. Already live in the Kingdom of the Prudes? Take inventory and make sure your weapons cache is complete. Maybe you are prude-neutral, sort of like Switzerland. Here is a chance to see what we have to offer. Or do you consider prudes a scourge and a menace? You either arrived at the Tuesday Prude by accident OR it’s time you learned the power of the prude. You may just wave a (freshly pressed) white flag and join us as we gallop forth to conquer a naughty world. The well-armed prude never heads off to crusade without first assembling the Defensive Weapons. A prude needs protection. We are only human. When the slings and arrows of outrageous indecency let loose, we can be in the line of fire. Our most basic means of defense is the Blush. Think of it as our chain mail. Employed when physical separation from a situation would be deemed rude or disruptive. Often donned at work parties when the boss gets ‘happy’ or family gatherings (ie. Thanksgiving dinner) when the talk turns saltier than the Green Bean Casserole. Other situations require greater protection. Meet the Squirm. The Squirm functions as our shield. A prude on the defense pulls out the Squirm in situations beyond the scope of a simple Blush. Imagine, say, a prude at the movie theater awaiting a PG rated ‘family’ movie. Suddenly the screen is blazoned with a decidedly non-PG-rated scene. Our prude, seated dead center in the row with dozens of human knees, quarts of spilled soda and thousands of popcorn bits blocking access to the aisle, has no where to run. Trapped, the prude engages the Squirm. What does the Squirm accomplish? It makes her harder to hit. Let say all a prude’s worst nightmares have been invited to a party. Surrounded by low-hanging pants on males, Heimlich Maneuver-tight tops on females, crude language coupled with poor grammar, rude interchanges, raucous music, and public displays of affection most prudes wouldn’t even consider employing in private, what is the prudent prude to do? Back Away and Leave. That’s right. We get on our trusty high horse, lower our visor and gallop off to our happy place. Don’t think our prude, cowering in front of ‘Andy Griffith’ reruns, has been beaten. Those defensive weapons merely provide a chance to regain strength. Before long the doughty Prude is back in the Armory gathering Weapons of Offense. Come back next week as we learn how to wield Prude Munitions. 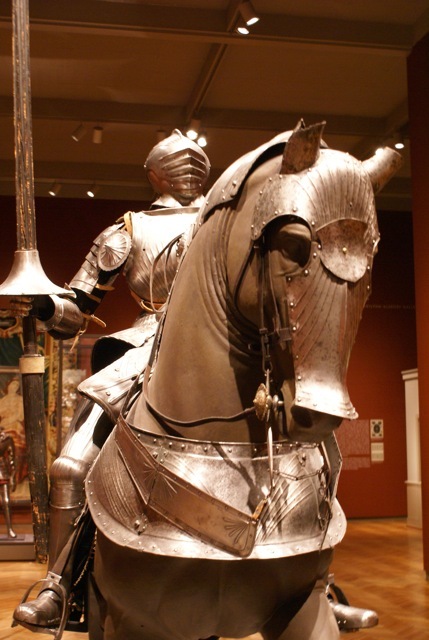 This entry was posted in Humor and tagged Andy Griffith, armor, crusade, Prude, weapons by The Tuesday Prude. Bookmark the permalink. Love this as usual. Looking forward to next week’s revelation of “Offense”! I’ll be back. My armor is in good condition! Loved it! As we say in the Regency; “He’s a rudesby” and I hereby coin the word Prudesby. Wow, those worst situations were topped by my experience with a germaphobe this weekend who thought nothing about regaling nearby folk about toilet germs…this while sitting at the meal table…this, from a man who has many of the marks of the true prude. Hmmm…go figure. full of surprises. And I really like the word Prudesby.